Not only are we not serious about the financial situation we are in, major portions of our public institutions are simply oblivious. If our state transportation departments had truly come to grips with the enormity of their financial crisis, we would be having a completely different conversation right now. The fact is, we're on auto pilot, and our current trajectory is a long, slow decline. Welcome back, everyone. I hope you had a peaceful and joyous respite. I certainly did. I'm very happy to be back and am looking forward to another year of Strong Towns. As always, we have a lot of new stuff planned; some experiments to push our boundaries and some building on past successes. Hope you hang with us and keep doing what you can to make yours a strong town. In the summer of 1992, I was sitting at my desk at the Minnesota Department of Transportation's Baxter office when my supervisor walked by in obvious agony. This was the first weeks of a college internship for me -- and a plum one at that -- where I was putting in my time in the traffic department waiting for a opening in construction. I had been doing a few speed studies and a lot of time killing trying to find ways to be useful. I watched my boss put a hand to his forehead and cover his eyes. He leaned forward and let his hair brush up against the wall. As he slouched there with his head hung low, a coworker -- looking equally dejected -- stepped up and put a hand on his back. The coworker's eyes were red and my boss was sobbing. "What is going on here," I thought, quite uncomfortably. I didn't know any of these guys well enough to more than superficially share in a personal tragedy. And I was certainly not in a position to inquire. As more and more people gathered it was obvious that, whatever had happened, everyone in our section felt impacted. They were all deeply, outwardly dejected. I found out shortly thereafter. An elderly woman trying to drive across Highway 371 in Baxter misjudged the gap between cars and was struck broadside. She was killed. And most tragically, this was simply another in a long line of similar accidents. The very real grief being expressed by my colleagues was a combination of compassion and professional frustration. Why were so many being killed on this highway? When America began the Suburban Experiment after World War II, a brand new profession of highway and traffic engineering was created. Through trial and error (where error often meant that people died), they developed a set of standards for how highways are to be constructed. If you ask most highway and traffic engineers, and nearly all members of the public, what the primary motivation for these standards are and there will be one answer: safety. Now to get into the weeds for a brief second, we need to acknowledge that there are many competing concerns that go into highway construction. Safety is the primary one, but safety is balanced with things like cost, economic development, travel speed, traffic volumes, political consideration and social factors. That being said, the general public's expectation is that safety would trump any of these secondary concerns. By a large margin, no less. There is nothing special about Highway 371 as it passes through my twin hometown of Baxter, Minnesota. It is similar in construct and design to highways found ubiquitously across the country. I use it as an example solely because I drive it and am familiar with its history. Readers can undoubtedly identify their own local example. Highway 371 is very dangerous. Sitting here writing this, I can immediately think of five fatal accidents in the past decade. The number is certainly more. The stretch of road that runs through Baxter combines high speeds with traffic entering and exiting at uncontrolled (no signal) intersections. In the vernacular we use here at Strong Towns, it is a STROAD (street/road hybrid). The WalMart, Cub Foods, Fleet Farm intersection was changed from a full access to a 3/4 access for safety reasons.One intersection in particular has always been peculiar to me. It began as a completely uncontrolled intersection (no signal, no restriction on crossing movements) that provided access to WalMart and Cub Foods on the west and Fleet Farm and their auto dealership on the east. This has always been a problematic intersection from a safety standpoint. I've personally witnessed accidents here and remember a string of nasty ones (some fatalities, if I recall correctly) being the driving factor behind restricting the turning movements. The first restriction of the turning movement was to eliminate the cross over for those entering the highway. A driver entering the highway could turn right and merge with traffic but was prohibited from crossing traffic to turn left. Drivers on the highway could still exit both right and left. This certainly didn't solve the STROAD's safety problems, although it did eliminate the most dangerous movement. As the photo shows, there is no stacking room here. Drivers entering the intersection on either side of the highway find themselves in a no-man's-land where traffic from potentially four directions is coming at you while you are trying to merge at highway speeds. It doesn't take a traffic engineer to see that this is less than optimal. Last summer, Mn/DOT, which faces enormous funding shortfalls statewide and in the Brainerd/Baxter district, did a project to upgrade Highway 371 through Baxter. From my vantage point, the primary impetus for the improvements was safety. One of the problems with the 3/4 intersection as it was configured was that traffic turning left across traffic impaired the site lines of the traffic turning left across traffic from the other direction. This was particularly perilous with the high speeds this stretch is designed for. 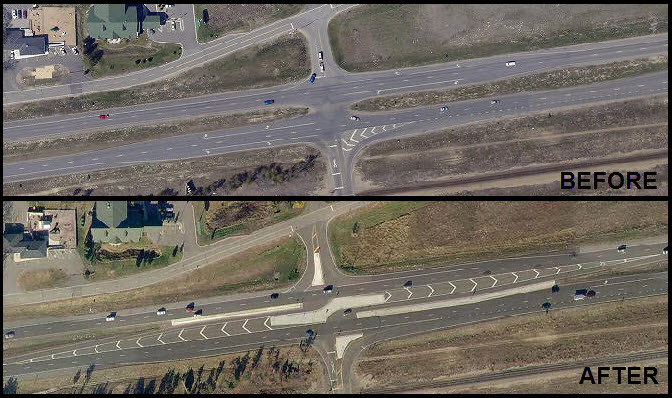 None of the sources I have for aerial photography have updated their shot of this intersection since the project, but I do have a before and after from a similar project up the STROAD. What Mn/DOT did was quite genius. They realigned the turn lanes off of the highway so that they are far offset from each other. This means that any stacking vehicles will not impair the site lines from oncoming traffic. The before image is a 3/4 turn intersection. The after image is a 3/4 turn intersection with the turn lane offset to improve vision. I'm sure none of this is surprising to anyone. We see this kind of thing all of the time. The STROAD is built. Safety problems develop and are identified. Upgrades are made to address the problems. Wash. Rinse. Dry. Repeat. I already mentioned how Mn/DOT is cash strapped. If we stick to the gas tax, we're literally talking $2-$3 per gallon increase in the state tax in order to maintain what we have. This aligns with the ridiculous numbers put forth by the national Infrastructure Cult. That is a revenue stream that is not going to materialize. If you think otherwise, you're either not paying attention or not grounded in reality. The transformation of this intersection cost $462,000. In the context of our national debate, that is not much money. Even in the context of the local Mn/DOT district, it is not a lot. It is not even crippling to envision ultimately doing this to the dozens of similar intersections along this stretch of STROAD (assuming people keep getting killed at current rates). Here's why this fascinates me. This intersection, where people have been seriously injured and killed, where we just spent nearly half a million dollars to make an incremental improvement to reduce the rate of death, where old ladies are still asked to judge small gaps between speeding cars....this dangerous intersection is a mere 970 feet from a very safe, multi-million dollar signalized intersection. There is only 970 feet between the dangerous intersection (recently upgraded at a cost of roughly $460,000) and a safe, signalized intersection.I'm going to assume you have the same question I do. Why is this dangerous intersection not closed? There is no traffic flow reason to keep it open. There is no safety reason to keep it open. In terms of travel time, yes, it saves a few seconds getting to the adjacent big box retailers, but is a few seconds worth even one more life lost? Why are we spending scarce resources making an incremental improvement to this intersection? Closing the intersection would be far, far cheaper and would vastly improve safety in the process. Couldn't that money be better spent in a location where a cheap, viable alternative was not available? Who is paying for this improvement and who is benefiting from it? Clearly the adjacent retailers are not being asked to contribute. Is there anyone but them who stands to benefit from an additional access a mere 1,000 feet from the full signalized intersection? The answer to these questions is clear. Our highways STROADS are not about moving cars. They are not about cost. They are not even about safety. The primary objective of this intersection, and of this STROAD, is to create a platform for quick, cheap, economic development opportunities. Period. Now I'm sure that someone is going to argue that Mn/DOT can't simply close the access, that the adjacent property owners (who Mn/DOT constructed a frontage road for) have a right to have the intersection remain untouched. Let's assume that is true (which it's not). 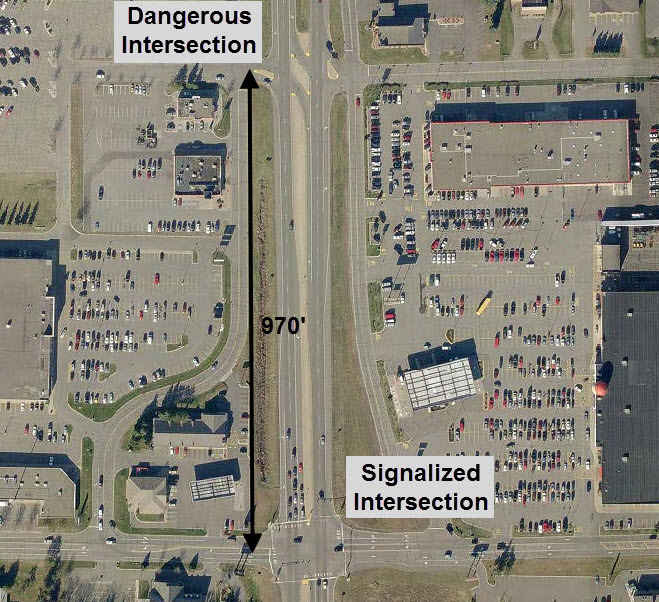 What would the "compensation" be if Mn/DOT lost a takings case for closing the intersection? More than $462,000? More than $2.5 million, the cost generally assigned to each traffic fatality? Is the city of Baxter, corporate Fleet Farm, Cub Foods or Taco Bell going to fight this? Not only are we not serious about the financial situation we are in, major portions of our public institutions are simply oblivious. If Mn/DOT -- or the DOT of any state, really -- had truly come to grips with the enormity of their financial crisis, we would be having a completely different conversation when it came to situations like this. The fact is, we're on auto pilot, and our current trajectory is a long, slow decline. Let's all resolve this year to start building strong towns. There's more to this conversation and you can follow it -- or better, join in -- over at the Strong Towns Network. There I'll be sharing some follow up notes to this post, taking your questions and continuing this dialog. It's free. Please join us. We'd love to have you there. And a special thank you to those of you that gave my book, Thoughts on Building Strong Towns (Volume 1), as a gift last year. Volume 2 is currently being edited and I hope to have it out soon. I spent much of my break unplugged from email/social media, but I did devote some good blocks of time to an original book project. More on that hopefully very soon.